Cars over 40 years will be exempted from MoT tests - despite a government consultation that showed more people were against the idea than in favour of it. Under the new rules, cars built up to 1977 will no longer be subject to the annual roadworthiness test, with the rolling exemption continuing each year in line with exemption from road tax. The move takes effect from May 2018. The government decided to press ahead with the exemption despite more respondents to the consultation opposing rather than supporting the move (1130 v 899). According to government figures, the move means that around 293,000 more vehicles (1% of the total UK car parc) will qualify for exempt status, on top of the 197,000 pre-1960 cars that are already MoT exempt. 40-year-MoT exemption: Do the figures add up? The move means that cars such as the Porsche 928 and Rover SD1 3500, both of which were introduced in 1977, will become MoT exempt, despite having powerful V8 engines. Jesse Norman MP, Parliamentary Under Secretary of State for Roads, Local Transport and Devolution, said: “After considering the responses, we have decided to exempt most vehicles over 40 years old from the requirement for annual roadworthiness testing. “This means lighter vehicles (such as cars and motorcycles) and those larger vehicles such as buses which are not used commercially. Heavy Goods Vehicles and Public Service Vehicles falling under operator licensing regulations will remain within the scope of roadworthiness testing. However, vehicles that still earn their keep during commercial operation, such as heritage buses and commercials, will still need to undertake the test, as will those that have been ‘substantially changed’, though the government is yet to determine exactly what that term might mean. The 40-year exemption was selected ahead of other proposals, which included changing the cut-off date to 30 years, introducing biennial testing and a more basic roadworthiness test for older cars, the latter of which gained most support during the consultation period. Enthusiasts who wish to get their cars MoT tested, if only for their own peace of mind, will still be able to do so, but the test will no longer be a legal requirement. Having been a mot tester myself (retired) and the owner of a 1976 Cortina I find the idea stupid. The number of classic cars I have tested that outwardly look to be in mint condition,Highly polished, nice interior but mechanical deathtraps owing to the fact that the owner knows no better is limitless. One example that I remember was being called to mot a lovely 1972 mk1 Capri with only 21000 miles on the clock from new. The owner had recently acquired the vehicle and driven 10 miles to us. Upon inspection I found the steering rack so worn that the steering arm was about to come away from the rack. My point is imagine the situation or similar of 40 yr plus vehicles being free of mot testing in the above situation ,who knows what could of happened. My Cortina will still get its annual test and any faults found will be rectified. I wonder if insurance companies would give a discount for vehicles that have a annual test in the future. What on earth is the rationale for this idiotic idea? Just because most classic cars are very carefully looked after and do not get driven many miles on the public highway does not make this ok. I was never an authorised tester myself but have also seen a number of absolute shockers over the years. Allowing a dangerous car on the road just because it is old is just madness. I just hope that nobody is killed or seriously handicapped in one of the accidents caused by one of these no longer mandatory tested vehicles. It's a matter of 'when' rather than 'if'. back on the road or sell it onto some unsuspecting buyer. I had the misfortune to write off my 1956 XK140 FHC after a 4 year rebuild. The first question I was asked by my Insurance company was "Have you a current MOT?" I had, it was issued 6 weeks earlier. I had no problem getting the payout, I am sure they would have stalled and wanted to have a engineers report on the car if I had not got an MOT. Every car needs to be checked by a third party engineer, My Stag needs new rubber drive shaft gaters again even though they were replaced for the previous MOT. They were made of poor quality rubber and within 12 months had perished. I have also had a similar problem with swivel joint rubbers as well. Not good. Cars like ours need to be checked to keep us all safe. Am I being very cynical, or is this a cunning plan to start restricting or prevent the use of "our type of cars"? When there is a bad accident, people are killed and the cause is an unroadworthy vehicle, there will be calls to take all these " dangerous, badly maintained and polluting old cars off the road. We will all be tarred with the same brush. The majority of Classic car owners are really careful about maintaining their pride and joy but the green and the health and safety lobby will be very vocal. we are a soft and easy target. I hope I am wrong. MJL. Sidmouth. Does this mean my 1965 Lambretta is exempt? Just another example of fat cat office bound decision makers with no personal or practical experience regarding the decisions they are forcing on the population as a whole and who sit on plush office seats with their brains firmly wedged between their buttocks. Hopefully the parents of the child who is killed by one of these vehicles will be able to put their grief behind them at some point. The classic car movement is very strong and our cut of date in Ireland is 31 Dec 1979 which is fixed, any car registered after that date is liable for NCT. Our classic insurance's are all of limited annual mileage and generally speaking our cars are used for classic runs, cars & coffee meets etc, very few are used as everyday vehicles. I agree fully with all the points made above. There's one thing about this change which baffles me completely: bearing in mind that we all have to pay a fee to the MOT testing station to get our cars tested, what benefit will it be to the government to have fewer vehicles MOT tested each year? If the MOT test were provided free of charge at the government's expense, I could understand the reasoning behind reducing the number of tests each year. However, it's not, so what's the problem? This looks like yet another strange decision by the current government in Wasteminster.All of the replies so far I agree with, although the end of the artical did state "Enthusiasts who wish to get their cars MoT tested, if only for their own peace of mind, will still be able to do so, but the test will no longer be a legal requirement." So I don't see the problem as most classic car owners like myself would want to have an MOT anyway [I hope].I would have thought that the insurance companies would want to know that at least as already mentioned. I can see only one possible reason for this decision, and that is a futile attempt to get classic car owners to vote for the Conservative party in the next election by saving them the MOT fee....yipee?!... I hope the chancellor is on board with this as he will be loosing revenue. let`s have HJ`s and his teams comments please. always well-trusted answers !! I shall still have my car annually tested for my own peace of mind. Madness! Just because an owner cherishes an old car doesn't mean it's roadworthy. What a dangerous idea. Most such vehicles are laid up for many months each year and any decent mechanic will tell you that non-use is bad and causes components to fall. I will continue to have my 1970 E Type Jaguar MOT'd annually whatever this stupid government says. 98% of accidents are caused by the nut behind the wheel not the nut holding the wheel on. Classic car owners generally maintain their cars up to a higher standard than modern car owners and of course much lower annual mileage. My 1975 MGB has only failed it's MOT once with a broken front spring. That failure means that you did not spot the broken sping and needed an MOT to do so. When the first fatality happens will we see the PC brigade leading the rush to ban nasty dangerous and noxious classics as death traps ??? The original MOT test was for cars over 10 years old on the basis that many important safety components were likely to have deteriorated. The age was gradually brought down to 3 years although that will shortly go up to 4 years. But to exclude some of the oldest cars on the road, most without any of the modern safety devices such as airbags or ABS or crumple zones is complete and absolute madness. Having just got back from having my 1972 Triumph Stag MOT'd, I hear this news and cannot understand this madness. I hope that my insurance company and all others that insure 40+ year old cars will make it a condition of the policy that the car has an MOT every year. At least a competant person checks over the risk areas and advises or condems before a serious situation occurs. I do however have some concerns at the competancy of some testing station as I followed a Kia diesel car which must have been under 10 years old that was pouring out smoke and noxious fumes but I assume had an MOT to be on the road. My Stag does not do this nor does my daily driver diesel. John H.
Very few accidents are caused by mechanical failure, but still think a shorter cheaper test of brakes lights tyres and steering would suit most classic car owners ,although these vehicle are usually very well maintained by their owners a second opinion is always worthwhile. A ridiculous idea and I really cannot see any good reason for it. The smart outward appearance of a classic car is no indication of it's roadworthiness and safety. Classic car insurers should insist on a current MOT before issuing cover which would solve the problem but such is the competition between insurers for business that's unlikely to happen. I speak as an owner of a 1949 Rover (already MOT exempt but regularly MOT'd for my own peace of mind) and a 1970 Morris Minor (which could now be MOT exempt but which I'll also continue to have MOT'd). My answer would be for all classic vehicles over 40 years old to undergo a basic roadworthiness test, no vehicle should be exempt. One wonders why they bothered to consult - and why so few people actually responded to the consultation. The idea is total madness, driven naturally by an EU idea, with which our stupid government follows (The sooner we're out the better). My 1958 Wolseley and 1955 MG are always tested and will continue to be. I had someone at a show this year say to me that they had decided to get their classic checked over, since it had not been looked at since the original MOT exemption came in! The driver/owner remains responsible for ensuring that a vehicle is safe and roadworthy, but how can one properly test the brakes without a rolling road? I wonder what view the police and insurers would take if a classic involved in an accident were found to be unsafe and in-tested. Nothing to do with the EU Harrovian, all to do with the UK government alone! My 1975 BMW 2002tii was recently MOT'd. It failed the first time around due to an inefficient front brake. The brakes felt fine to me on the road. The hydraulic fluid had been changed prior to the previous years MOT with a full brake system check which resulted in a new rear brake cylinder being fitted. It passed a few days later this year after remedial work. It had covered 2000 miles in the year. As with all above the car will be MOT'd every year, as she has been, as required, since I acquired her in 1980. The MOT gives me peace of mind about my own safety never mind anyone else whether they are in the car or outside it. I own three classic cars, two of which are pre-1977 and all of which are maintained to garage standards ( I worked in a family garage in the ten years before the start of the exemption period.) The present MOT regulations are unsuitable for older cars and so I am happy that the test is being discontinued, though I would have been happy if a different test which examined brakes, lights, steering and structural integrity replaced the present MOT. I am completing a very long term Morris Traveller restoration and this will be ready late in 2018. I shall take it to a MOT station and have it tested (even though it won't be strictly necessary) and any deficiencies will be remedied. After that I shall have periodic examinations to ensure that the vehicles are roadworthy but I will continue my regular maintenance schedules. As a graduate engineer who has been rebuilding cars and motorcycles since my teens I know the precise condition of every part of each of my vehicles and none has ever failed an MOT. Although I will continue to take my old cars for an MOT this ruling does however mean that I have the freedom to road test my vehicles legally (when the MOT has expired) prior to booking a new MOT test. I therefore see it as an advantage for owners who are mechanically competent and I believe that such people will also continue to get their vehicles tested because insurance companies are bound to increase premiums for cars without an MOT. NOT a good idea, basic test would be better than no M.O.T. I have M.O.T. for my Aston DB6 from 1972 to date & will continue to do so. In light of the recent, 14th September 2017, outcome of the Consultation [Sept 2016] relating to the Roadworthiness Testing of Vehicles of Historic Interest [VHI] I am particularly interested in your experience / views regarding using your [VHI] 40 year old vehicle, which under this new ruling from the DfT is exempt from roadworthiness testing, outside of the UK. Given that some of us are contemplating European Touring in 2018 we are concerned of the implications of this new ruling. 1. Does your vehicle have to comply with the current rulings in the country you are visiting with your VHI? 2. Is there some exclusion / exemption based on a time scale? 3. What are the testing standards in France for instance? 4. What are the testing standards in Eire for instance? 5. What are the testing standards in Austria for instance? 6. What are the testing standards in Germany for instance? 7. What are the testing standards in Holland for instance? 8. What are the testing standards in Belgium for instance? What has not been considered in the comments is the risk to safety presented by this initiative which I believe is negligible. The article states something like 500,000 vehicles will qualify for exemption. Applying some statistical thinking consider this; according to government statistics there are 36.7 million registered vehicles in the UK. Let us assume for the sake of this discussion that just 1% of all vehicles MOT,d or not on the road both classic [40+ years] and modern [younger than 40 years] are considered to be in a less than roadworthy condition.That works out at 5,000 classic vehicles and 36,200 modern vehicles. We then need to consider that classic vehicle owners in general cherish their vehicles and some will continue to have them tested, and they cover much smaller mileages. Whereas modern vehicle owners generally do not cherish their vehicles as such and cover much higher mileages, it seems to me that that modern vehicles present a much higher safety risk than classic. Obviously I cannot attest to the veracity of my assumptions here but I think they are a reasonable statistical stab at the situation and offer some proportionality to the discussion. I would guess that the Government would have conducted a similar risk analysis before but giving the green light. For me personally it circumvents a lot of hassle, in not having to drag myself and my several prides of joy down to the MOT tester every year with less than a 1000 miles on the clock since the last visit. although you have obviously given this some thought and tried to break it down into "numbers".I can not agree with your conclusions at all.It is like saying that because 5% of road deaths are caused by drunken drivers, it means that the 95% of road deaths are caused by completely sober drivers and therefore it is much safer to be above the limit when driving ,ie drunk.The point is there is absolutely no reason what so ever not to have a proper road worthiness test on any vehicle that uses the public roads in the UK.There has been [excuse me if I am wrong] no reason at all given as to why the test is not required for older vehicles.I know that this is already the case for a few vehicle , and I have never understood that either,but to suggest that new[er] vehicles are more dangerous is ludicrous and can not be measure statistically in the manner that you have outlined. I hope that you have the appropriate test equipment at your disposal [Brakes etc] if you are not going to -"drag myself and my several prides of joy down to the MOT tester every year". The reason for exemption is computerisation. A vehicle's technical statistics is stored on DVSA's computers, such as braking performance, emissions, weights etc. but put a classic on the ramp and the computer immediately fails it because it has no details on file, requiring the tester to go through lots of deletes/voids/going through to DVSA etc. Last year was the first time my 1976 Chrysler had problems due to the introduction of computerised braking stats in the test, as although the manual dials showed the brakes to be as good as new car (quote from 20 something yr old tester) it wouldn't pass because the DVSA did not have braking performance statistics on record. This resulted in a 30 minute delay (time is money, and MoT testing is a loss activity) in getting it 'passed' on the computer. Also note how many dealers now don't do MoT's and send customers to local garages because they can only charge £50 odd for a test that takes about 45 minutes with computer work, yet they can charge £150 plus per hour if the person is doing services and not MoT's. I was not aware that the issue was to do with the computerisation of the MOT system, and thanks for pointing it out.However, that being the case, why have the responsible bodies not modified the various computer programmes so that other older vehicles can be tested.It is not "rocket science" and should be easily integrated into the current system without much cost.It does not however justify the obvious risks to both the general public and vehicle owners, and I would love to hear a rational explanation as to what effect this will have on road safety etc etc....or are "they" just hoping that older vehicles will disappear and everyone will buy brand new electric ones as proposed by the latest Wasteminster roose ?!?!? I am a little concerned as to there being no definition for 'substantially changed' vehicles. I own a kit car (RMB Gentry) built on a 1967 donor (Triumph Vitesse) but which was completed as a Gentry in 1975, so making it 'Historic' in its own right in its current form. So, does 'substantially changed' apply as it is a kit car, or does it NOT apply as it has been in its kit car persona for more than 40 years? Personally, I think the time and (relatively little) expense to get the MoT is worth it for the peace of mind. (I don't have a car lift so inspecting the underside / suspension etc. is not really practical. I'm happy for my local tester to give it a good look over once a year). As a MOT Tester since 1979 and the owner of 3 classic cars and 4 classic motorcycles i think this is a really good idea, the owners are mostly a right pain when they bring them in, most dont like their precious old cronk to go into a garage anyway. Well done the government. Dont think many wheels will actually fall off. My 1976 cortina. My e type blah blah. Idiots. It's a real pain getting my clapped out old bangers Sorry I meant to say classics. Through the annual ordeal. You know getting the lights to work ha they never do changing the mufflers so it doesn't deafen the tester St last some common sense. Powerful v8 the rover pleeeese my 69 Chrysler goes 135 now that real is frightening with all the slop and no brakes. Best thing the government has done for a long time , about time they gave the motorists a break , most classic car onwers only use them at weekends , going to a show or cruise and never in the rain . And these vehicles are kept in tip top condition , my old girl only did 200 miles this year . So we'll done Westminster for helping us out for a change and not hitting us again in the pocket . I think this is a brave move to relax the rules. I personally think pre 1960 cars some with cable brakes would be a danger and these are exempt right now. Since the 60's most cars have had a better brakes and suspension. I think most responsible owners will put their cars through a pre Mot to make sure a third party checks for leaks, structural damage etc. As it stands currently with the MOT you can still be stopped by the Police if a Car appears to be unroadworthy. Of course as others have suggested who knows what other rules will come into effect which may prevent cars from being used due to pollution and age. If you submit your mot exempt car for a 'voluntary' test and it fails, are you then committing an offence for knowingly driving a defective vehicle? Does it then follow that when your 'fail' certificate expires after a year the situation reverts to how it was previously? Can an exempt vehicle be registered on the dvla computer for a test anyway? As a side point to older motorcycles and MOT testers, I took my "youngest" bike in for an MOT in September to the local MOT Specialist that only does MOT's. As he didn't know his a*** from his elbow when it came to slightly older bikes, the tester left my air cooled engine running at a standstill for approximately half an hour, causing damage to the head. When I got the bike home there was oil p***ing down the barrels from what I can only assume until I strip it, is a warped cylinder head or blown head gasket. As far as I can work out, this complete oaf must have assumed that the factory standard oil cooler was a radiator so thought it was a liquid cooled engine. I have tried emailing their head office with complaints but they don't seem very willing to reply. My bike is only a 1991, god knows what these a***holes would do to my late 70's, early 80's bikes! Perhaps this will enable the insurance companies to avoid paying up in the event of a claim by claiming that the vehicle has not been kept in a perfect roadworthy condition. As detailed in the lengthy terms and conditions of insurance documents now. Maybe political lobyists paid by corporate interests created this legislation. After all,we dont live in a democracy, but a corpratocracy. So, I only heard about this yesturday from someone I was working with who built a Midget from ground up and cherishes it every day, it's a nice ruling for him although he said it will still be getting tested for his own peice of mind. The bit that really, really annoyed me, was that after 6 and a half years of ownership of my 2000 reg Peugeot, I have (last month) had to send it to scrap heaven as the car itself is completely rust free well looked after and the only thing it failed on was emissions not by much. I frantically tryed everything you would to pass it within reason(cat, lambda, injectors, etc... List goes on) yet it wouldn't pass. So although it is road worthy in every other aspect it is just the crap (no smoke by the way either) coming out of the back of it that made me have to scrap it as it wasn't 'road worthy' in the Government's eyes. I see newer cars driving round in such a bad state and think how the heck did that pass an m.o.t yet mine can't. I love classic cars and would love to see more back on the road, but as mentioned in other replys, what happens to those barn finds just thrown back on the road with rust holes through the chassis, it's annoying that something like that could be driven in a dangerous state yet my car that couldn't pass only emissions yet is road worthy in every other aspect can't !! Annoyed honestly does not describe it. It's funny how all the people who are saying it is rediculous are genuine classic car owners not just Joe Bloggs sticking their two pence in, doesn't that say something. I think the Government thought it would be the other way round. It makes you wonder who actually made the decision to go against the survey, was it a Government bigwig with an 'un road worthy' classic who thought it would be an easy way to keep their car on the road and also 'save a quick buck' in their pocket at the same time. I always hear the saying 'I'd love a classic but couldn't afford the maintenance'. That saying will surely disappear when people can buy one in rough condition and drive it with the minimal maintenance, it's not just dangerous it could ruin some classics that were good enough to save. All I can say is the same as above, what happens when there is a crash, how do you justify that? It's really sad as you know the Government will find a way to wriggle around it until there is a fatality. An MOT Test is only valid on the date of issue, a statement on the certificate front ' relates only to the condition of the components examined at the time of test. It does not confirm the vehicle will remain roadworthy throughout the validity period of the certificate'. Classic vehicle owners tend to keep them mechanically fit, the annual mileage being lower than an everyday vehicle actually would make them a safer bet on our roads, albeit there will be some vehicles which won't be.. Cars that fit the new - 3 year old catergory don't automatically qualify to being safer as there is no mandatory requirement to have them serviced or inspected either by a Manufacturers main dealer or one of the many so called 'garages' employing so called qualified mechanics that lurk on every street corner. In fact the ratio of so called unroadworthy classics against newer car is a lot lower. People think modern car has all safety items and warning lights fitted will tell me when it goes wrong. I have spent many years as a Roadside Patrol with one of the motoring organisations and you would not believe the amount of unroadworthy modern vehicles there are out on our roads. Statistics have proven and will continue to be gathered to enable this change to be monitored and no doubt if required will prompt a rethink. May I suggest that we all wait and see and not to be so fast as usual to react negatively towards change. All you experienced MOT testers, if your all so concerned and passionate why not offer free MOT tests to classic car owners. I have mixed feeling about this, as over the years the mot has changed and even younger cars cannot easily be modified to satisfy the standards, as pointed out by the Peugeot owner above. Older cars are even more affected. I have what was considered the safest car on the road in 1960, but in the owners handbook it pointed out that the handbrake would not hold the Car on an incline and it relied on the car being in gear. I got the car in 2001 and it failed the mot on the hand brake failing. Having presented the handbook to the examiner he did not accept it and agreed to rebuild the brakes to work, on the basis I would pay if he got it to hold and he would pass it if he could not and not charge me. 3 cables later he passed the car free of charge. Every year since he has showed discretion on this, but what will happen when he retires? Another car has a steering idiosyncrasy that is treated in the same manor. I’m in favour of having the cars checked, but we live in an ever more litigious obsessive world and driverless cars will be the norm and mot stations will also be a thing of the past together with air bags. Cars of a certain age are more often than not owned by people of a certain age - the majority of whom will apply plenty of TLC, however, I see that it is the selling or passing on of older vehicles,that may not be so well cared for, is where the problems lie. Maybe, a statement of roadworthyness could be implemented with a photograph record at the time of sale, or say every 5 years for cars that do very little mileage - at least there would be a way of policing them by specialist inspectors who consult with the relevant clubs. As like many who have commented on this ridiculous change to the MOT regulations for cars 40 yrs of age or more, "I am totally against it", as it only serves to allow un-roadworthy vehicles knowingly or not to be used on the UK's roads but not to contradict myself, I see examples of dangerous modern cars being used in my daily work as a recovery truck driver and when you point out the defects to the owner the usual response is a "shrug of the shoulders" and they wonder why their car is being loaded onto my truck?. In my opinion, most drivers know about the law regarding MOT's, "An MOT is only valid on the day of it being tested" and this is being exploited by the majority of car owners??. Myself, I own a 1963 MK1 Humber Sceptre for which I fully restored and the MOT fell due Dec 2017 and I toyed with the idea of parking it up until May 2018 and then off I go saving the £35 mot fee but I relented and took it in and had the nail biting mot test done and although it passed the inspector pointed out 7 advisory problems which I had not noticed but have now been corrected for my own satisfaction. I for one will continue putting my car through the yearly mot if only for my own peace of mind. The comment from the former MOT tester well hearts are bleeding tonight. MOT's are a license to print money, Ive come across more dodgy MOT stations than Arthur Daily's used cigar butts. Last year a twit at one of these stations jacked my mini up on the engine sump and fractured the hydraulic suspension mount. Then I heard that staff from the local authority where going into this former public sector station during Christmas and saying "£50 on the table I want an MOT on my car" this as £30 fee offer testing station. Then we heard of a parking ticket camera enforcement car being given an MOT while it was locked in a police compound. I took a fiat coupe once to an official station he charged me £99 for the MOT and to replace a rear number plate bulb. This is GOOD news I can look after my car myself and need no sly sticky fingered wally to tell me how to keep my classic car, on the road. This test is nothing more than a jack the lad control freak methodolgy of getting money out of tax payers and stiffing drivers for uneeded service and remedial works. Well done Tory government. DVLA/DSA there is no recourse aganst your MOT centres unless small claims are involved, you wont police them properly. As a mot tester with 40 years experience I belive the current mot test is not pratical for 40 plus years old cars , saying this a lot of experience comes into effect when testing historic vehicles and many owners of historic and classic cars get very upset when a let's say .. not very experienced tester ie 20 year old who don't even know how to open the bonnet on a e type jag or probley never seen one make stupid mistakes and the presenter has to put him right !. I have a 1971 Spitfire IV on which the MOT expires in March, but which is currently garaged over winter. The tax reg runs to 1st May (its £0 now). Q. Could I wait until the new MOT exemption rules come in May and re-tax without an MOT certificate after that? So my MGB was 1ist Reg'd Aug 1978 and so I assume I will still have to have anual MOT and pay b***** road tax..? It seems entirely reasonable to me. Statistics show that very, very few classic cars fail MOTs (despite the scaremongering stories here) and it is in any case getting increasingly hard to find testers who know how to test classics. Yes, they should just follow the instructions but many don't. I have, for example, had an MOT tester who had never seen a separate chassi before and one who failed a classic Citroën for inoperative handbrake because he had checked its effect on the back wheels. There are far, far more unroadworthy modern cars on the road, either less than three years old or older but without MOTs than there are dodgy classics. 2. Steering rack/box check, including track rod ends and upper and lower ball joints/swivel assemblies. 3.1 set white lamps front and 1 set red rear plus indicators if fitted. 5.Check exhaust fixings for tightness and security only. 6. Visual inspection of glass particularly front screen being crack free. Hopefully this would limit the likelihood of vehicle failure and lessen the risks to the owner and other road users. ACCORDING TO THE GOVERNMENT WEBSITE ONLY PRE 1960 CARS ARE EXEMPT FROM AN MOT TEST? You must get an MOT and pay vehicle tax. You must get an MOT, but don’t have to pay vehicle tax. You don’t have to get an MOT or pay vehicle tax." As always I check all the lights, horn, tyres, fluid levels etc, etc, prior to attending. Once on the rollers it was noted that one of the rear wheel cylinders had developed a leak so brakes failed the test. I drove it home changed the cylinder and shoes and went back the next day to get it re-checked and a new 12 moths MOT. So it would seem if a classic is only used every so often and not legally requiring an annual test then certain points won't get highlighted due to component failure as in my case plus on the way to the MOT station I applied the brakes several times and it pulled up in a straight line. > I will still get an annual test / check carried out for peace of mind. A really stupid idea, not just because of the safely aspect but because you may find yourself uninsured. If you have an accident in 40+ year old car with no MOT and a fault is found on your car, there is a very real possibility that the insurance company will refuse to payout. You will have an uphill struggle to prove you have maintained the vehicle properly. An MOT is evidence that you have submitted the vehicle for inspection by a qualified mechanic and that it has been deemed roadworthy. Without this evidence you could be in big trouble. Unsure what the process will be for Classic vehicles over 40 years old classed as having ‘substantial modifications’, such as upgraded engines? In most cases it seems these vehicles will not be allowed mot exemption. Will this mean that modified classics could be gradually and effectively legislated off the road with stricter emissions and safety MoT standards? I have just had my 1961 Land Rover tested, the car has done less than 200 miles since last year, the bottom steering arm on the damper was found to be loose, this wasn't evident until the testers assistant was activating the steering on the ramp, I'm not sure how one person can check a car thoroughly by themselves without a proper ramp, I've done a nut and bolt restoration of this car so know it inside out however it is still good to have it tested by a third party. Since by law the MOT worthiness only relates to the day the certificate is issued there has never been a guarantee that a vehicle is roadworthy the following day. Youngsters have been known to borrow wheels and good tyres to pass the test and revert to their worn out tyres afterwards. That is certainly not in the spirit of the test, however these sorts of things occur. The value of a historic vehicle and the insurance restrictions i.e. mileage, means that it isn't in use daily and therefore not subject to the same wear and tear that one used for, perhaps, commuting. Its value is very much related to continual maintenance. It doesn't make sense to have a wreck of a car because classic car insurers need evidence of its market value. Insurers aren't stupid although we imagine it would not be hard to present them with evidence of a car in Concours condition. When the claims adjuster visits after a claim, they will see through that straight away. Some of the new MOT tests really do not apply to a historic Military vehicle that may possess black-out lights that are for show only (we haven't had to use black-out lights since 1945) and yet if the car has them they have to be working. My life and any other named driver of my historic vehicle are particularly precious to me as the prime safety inspector of my vehicle. Its limited use means listening for any unusual sounds and feeling for changes that most people don't experience in their daily cars. They gradually get worse without noticing. 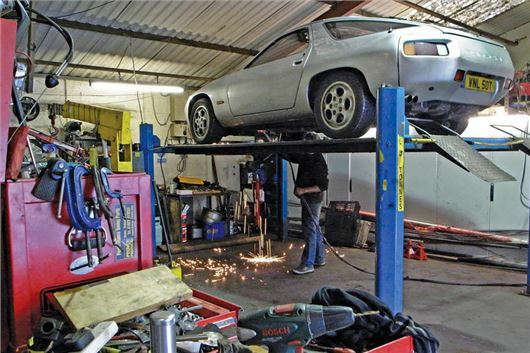 Modern car owners will often sell a vehicle that needs a lot of work. Will neglect to have a proper service as it is costly. They are the ones that need the MOT after three years, because they could be dring a death trap. My measly 3000 miles per year has had no appreciable effect on my historic vehicle and it gets more love and care (do to its appreciating value) than any other vehicle I have ever owned or likely to own. I would pit it against any three year old modern vehicle that has yet to have its first MOT. The truth is that most car owners rely on the MOT to be sure their car is roadworthy and often they neglect regular servicing because of it. there are very few used vehicles with up-to-date service histories and the majority lapse after the fourth year with huge gaps in the record books. A genuine dealership used vehicle will have a full service history but they a re few and very far between. It's your life and everyoe else's life and the onus is on each and every one of us to do the right thing. I have a 1976 reg, Morris Marina, belches out smoke, rusty as hell u derneath, brakes wouldn’t stop it in under 100 yds at 10mph, steering wander above 20mph, going out today for a lovely drive tax & mot free, thanks Mrs May & your team lol. What a way of thinking. Does he really think that it is okay to save money by driving a dangerous heap? Surely we need to think differently and be responsible for our lives and the lives of others and not leave it to a nanny state to enforce a mandatory tests to prevent accidents and loss of life. The best way to prevent deaths is to keep idiots off the road and not 30 year old cars.